The shipwreck that ​almost cost me my life! WHO FOUND THE GILT DRAGON? John Cowen, Jim, Allan Robinson, Alan and Graeme Henderson. There where lots of legal arguments going on about the discovery & salvage of the Gilt Dragon, but as far as I knew at the time when he invited me to dive on it with him, Allan was the only one of the original finders who bothered to legally claim the discovery of the Gilt Dragon and he had applied for the salvage rights on the wreck. The Gilt Dragon becomes a shipwreck. 28 April 1656, the Gilt Dragon struck a reef 5.6 kilometres off the coast of Western Australia. 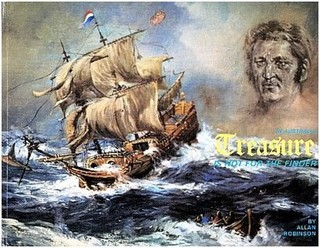 On board were Bronze canon, Elephant tusks, thousands of Ballast bricks, Earthenware jugs, Eight chests of silver coins and a crew of 193 (118 drowned). 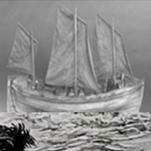 ​Seven brave men in a dinghy set off on a 1,400 nautical mile journey to seek help from Batavia. Amazingly they succeeded and reached their destination but sadly various rescue missions failed to find any trace of the remaining 69 castaways. The mystery remains to this day. 14 April 1963, the wreck of the Gilt Dragon was found at Ledge Point, Western Australia. 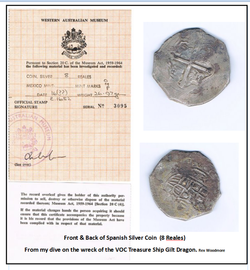 It was the first discovery of five known 17th and 18th centuries VOC and English East India Company shipwrecks on the coast of Western Australian. Thousands of Spanish silver coins (Pieces of eight, four & two), Bronze cannon, Ivory Elephant tusks, Earthenware jugs and hundreds of Ballast bricks, were found amongst the conglomerated wreckage of the Gilt Dragon. 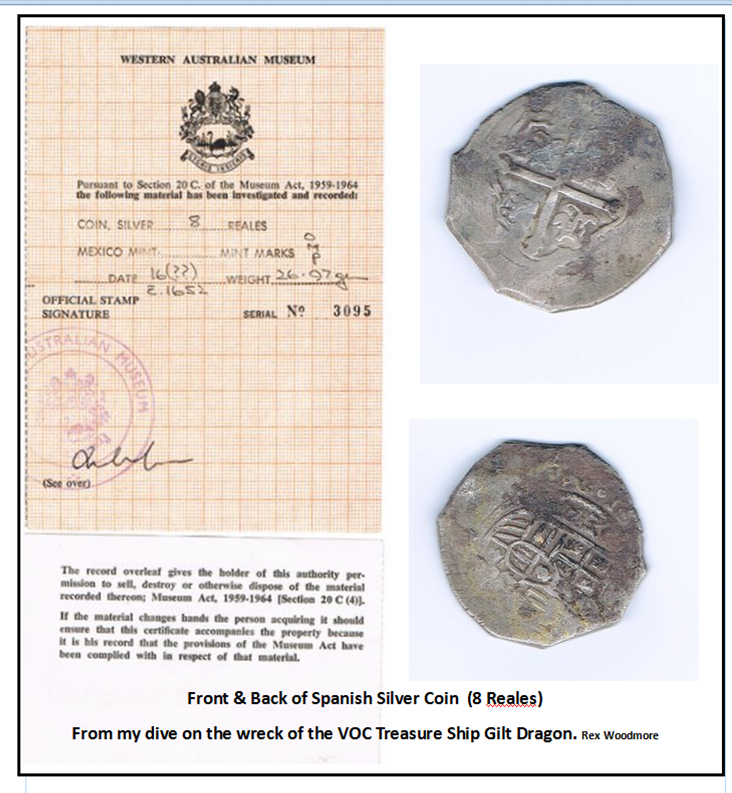 Rex Woodmore's Gilt Dragon Coins and Value adding Museum Certificates of Authenticity (Below) Several other coins were stolen in a house burglary. 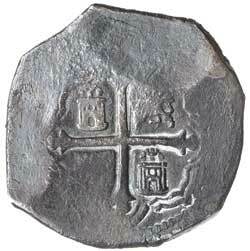 These remaining two coins shown on this website are held safely by a third party. Gilt Dragon Coin. Rex Woodmore's Museum Certificate. Artist impression of the small lifeboat. When the Gilt Dragon sank, with its crew of 193, only 75 of them made it to shore. A lifeboat with 7 of the survivors, was sent to Batavia for help. When they arrived in Batavia, two rescue ships were dispatched but failed to find any wreckage or the survivors. ​To make matters worse they lost another 11 men & a boat in the search. 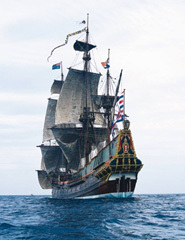 In January 1658 two other ships were sent out but were also unsuccessful. A boat from one of these ships disappeared but almost six months after having been given up as lost returned to Batavia. Both the Gilt Dragon and the Batavia belonging to the Dutch East Indies Company (VOC) would have looked similar to the ship at right. 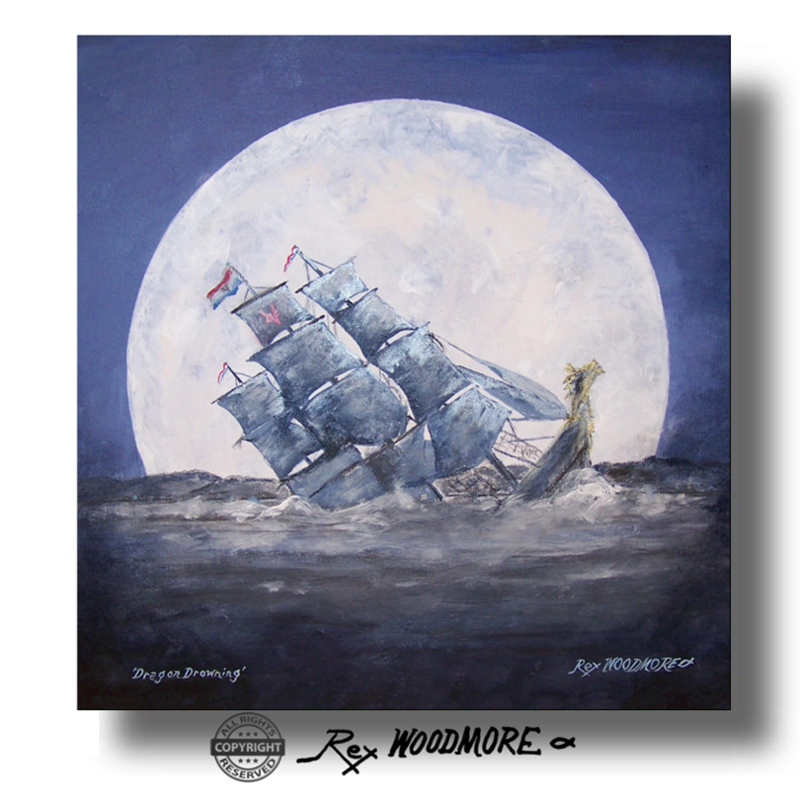 They both carried treasure & were both wrecked in Western Australian waters. Gilt Dragon Research Group is a volunteer group of Scientists, headed by Steve Caffery, seeking to digitally record any and all information related to the Gilt Dragon wreck off the coast of Western Australia in 1656. The Gilt Dragon Research Group take digital images of artefacts in private collections, record stories of adventure and discovery and preserve this information for future generations. They do this because most artefacts were discovered in the 1960's causing a surge of interest and discovery. With time, many items of historical significance have been lost, relics are being used as doorstops, coins have been hidden away, and exciting stories of adventure have been forgotten. We wish to record images of artefacts and stories of discovery before they are lost forever. Gilt Dragon Research Group Pewter replica coins for sale. WHAT HAPPENED TO THE BRONZE CANNON? I saw & touched at least one bronze cannon on the wreck. In trying to find out I came across a W.A. Museum publication that said there were no bronze cannon on the Gilt Dragon (?) I have not received a reply to my comment to them regarding the fact that I had seen and touched at least one bronze cannon on the wreck. Screen Capture - Cannon Superstore. 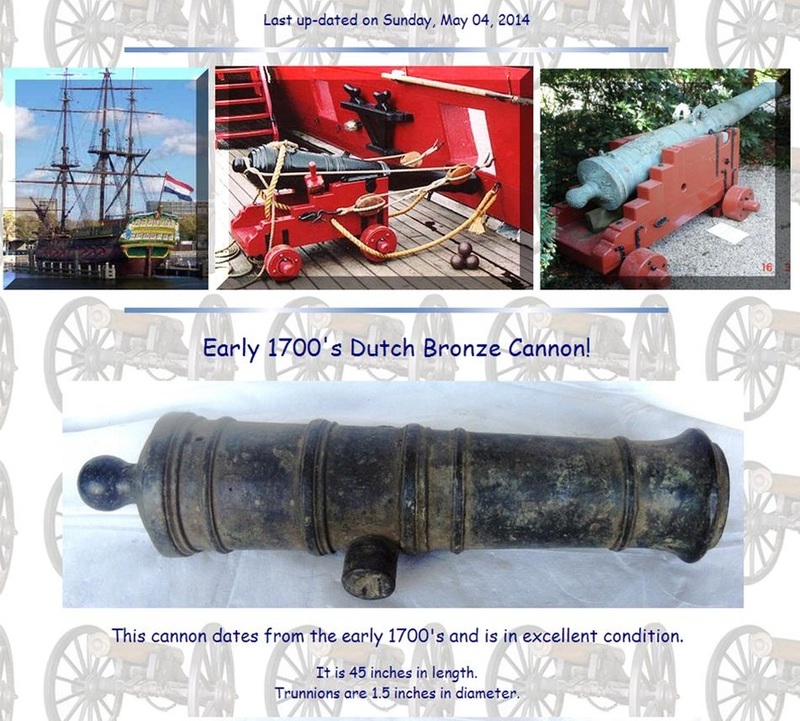 All Dutch VOC cannons are in great demand from collectors around the world and we sell them VERY FAST! 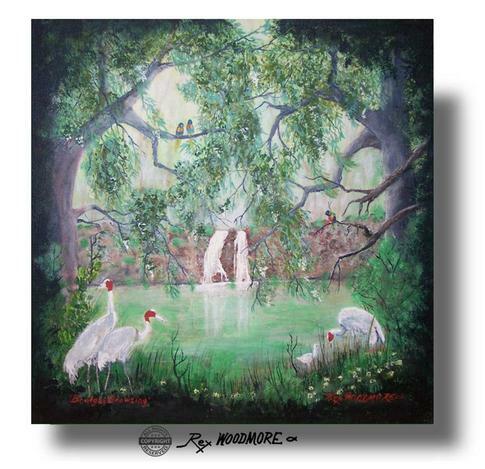 Most of the ones we acquire are sold before they even appear on this website. If you want one of the cannons listed on this page - please do not hesitate to contact us or let us know exactly what you are looking for! This page changes almost every day. If you are looking for a reasonably priced VOC cannon, please bookmark this page and come back often! Regarding information wanted on Allan Robinson's book. To me the book filled in a lot of gaps during the time that I was in the Army (National Service) and lost I track of him. ''I have a present for you!" opened a box and handed me a copy of his book which he had just picked up from the printers. He signed it for me & that was it. Sadly then I have since lost it. Perhaps lent it to someone? The book could be a good investment & a good read. I found it was a little bitter & lacked Allan's usual great sense of humour. I liked Allan & I am indebted to him for risking his life to save mine on the wreck of the Gilt Dragon. www.facebook.com/divingwawrecks Diving the wreck site of the 1656 shipwreck of the Vergulde Draeck, also known as the Gilt Dragon. Wrecked off Ledge Point north of Perth in Western Australia. ​The site has been fully excavated and all that is left on the site it the cannons, anchors and some scattered building bricks. 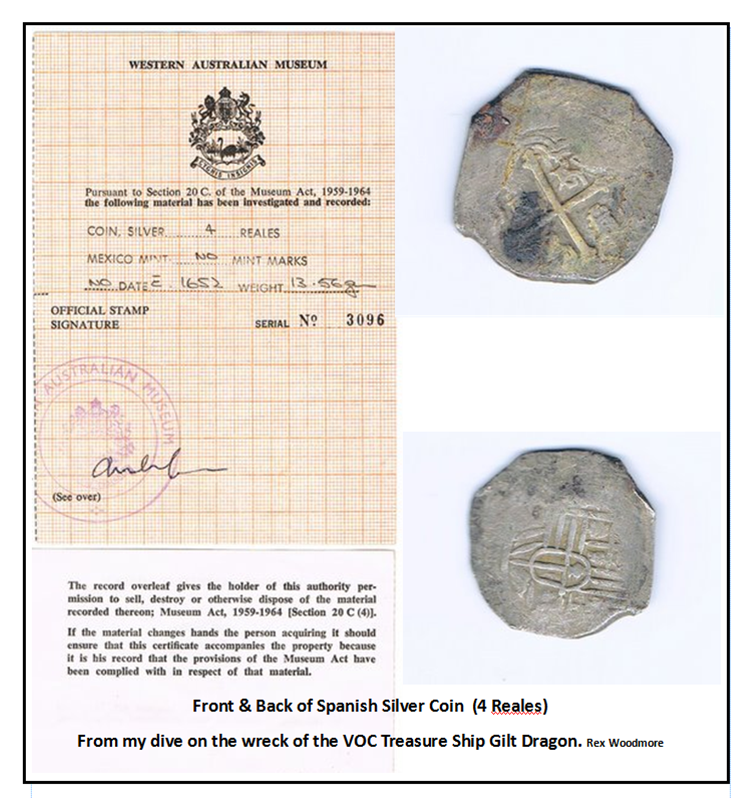 Photos included from the Western Australian Maritime Museum, Shipwreck Galleries Vergulde Draeck display. John Cowen; Allan Robinson; Jim, Alan and Graeme Henderson, who were the five spear-fishermen who discovered the wreck (Graeme Henderson, is now the director of the WA Maritime Museum) followed by many individuals including local Cray fishermen, Divers from the Police diving squad, Navy divers and the Underwater Explorers club of Western Australia, including me (Rex Woodmore). During this time (prior to the shipwrecks act as it became known) and within the existing, or rather the non-existing, Maritime Archaeology laws of the time, many souvenirs were taken from the wreck. Later the museum requested that all items from wrecks, older than 1910, be taken to the museum for cataloguing. After which they were returned, together with valuable museum certification (at no cost) to the finders. 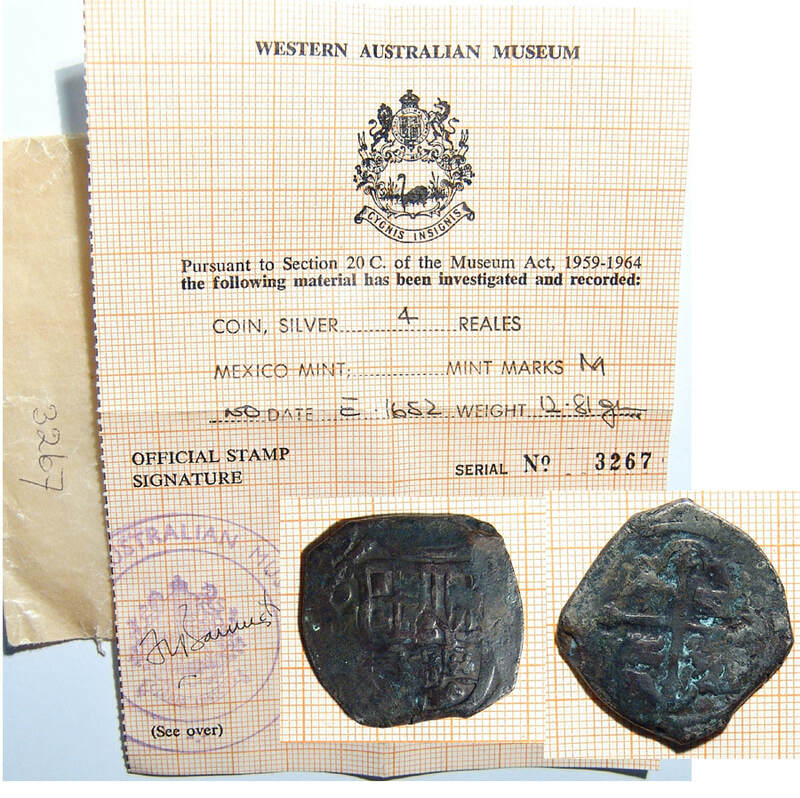 Prior to the museums involvement, souveniring by many individuals from all walks of life and salvage operations carried out by Allan Robinson, were considered to be quite legal. Unfortunately in the eyes of modern marine archaeologists it is considered and perhaps unfairly referred to as ‘’Looting”. If it was looting then the souvenirs would not have been returned to the so called ‘’looters’’ with the added value of museum certification, nor would Gilt Dragon artefacts seized by the C.I.B. from Allan Robinson have ever been returned to him. The discovery of the Vergulde Draeck and the other significant pre-colonial wrecks was the catalyst for the development of maritime archaeology in Western Australia., a globally acknowledged centre of excellence in maritime archaeology. The Museum has undertaken extensive excavation work at the Vergulde Draeck site and has painstakingly removed and conserved a wide range of material. The collection includes African elephant tusks, ballast bricks, beard man jugs, ceramic masks and medallions, clay tobacco pipes, bronze and brass utensils, various tools, glass bottles, an astrolabe and many silver coins. 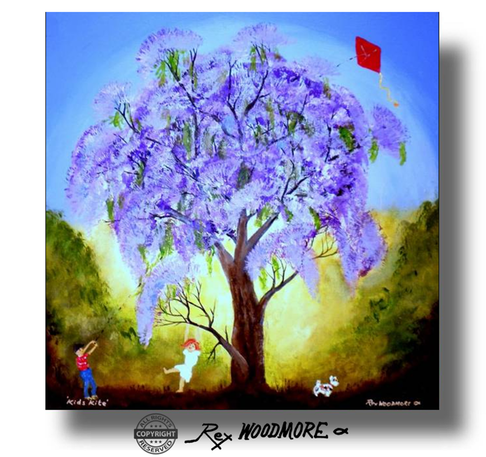 When the secluded and pretty little township at the mouth of the Moore River was finally formally gazetted in 1951, the historian Henrietta Drake-Brockman recommended that it be named Guilderton in honour of the 'Gilt Dragon' and the thousands of guilders worth of silver coins it was carrying.